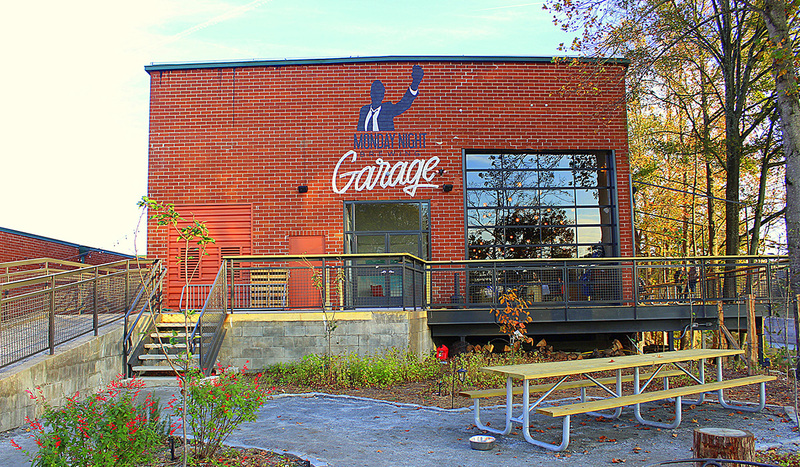 It’s just a little past 2 p.m. on a clement October Friday in Southwest Atlanta, and the newest addition to its beer scene—Monday Night Brewing’s Garage, a facility dedicated to sour and barrel-aging beers—is evidently becoming one of the area’s popular chill spots to spark off the weekend. It’s the second addition to Monday Night’s family; its original brewing headquarters opened in West Midtown six years prior. Compared to its grandiose kickoff two Saturdays ago hosting more than 1,500 people gawking at the complex’s 22,000 square feet unveiling three stainless tanks, two foeders, a koelschip called the Crunkship, chandelier lighting, three taprooms, and beloved native ATL rap group The Nappy Roots rocking the crowd outdoors, the Garage’s current lunchtime serenity would’ve been virtually unimaginable. Visitors mostly in their 20s are sitting at tables scattered throughout the building’s expansive foyer. They are either splitting a pizza from a nearby shop, in a group playing the “Heads Up” charades game yelling clues at someone holding a smartphone to their forehead, or individually pounding away on laptops with headphones; an eclectic mix of lounge grooves, 80s hits and hip-hop from its “Golden Era” serves as the soundtrack for everyone else. The common denominator is they all have the Garage’s signature stemmed glassware containing brews of various hues and styles to help usher in the weekend. At the “Pegboard” taproom bar in the front stands Monday Night co-founder and CMO Jonathan Baker; he is lightheartedly titled “the reasonably qualified creative guy” on the company’s website who handles everything from marketing and branding to social media. Obediently sitting at his side is Eden, a black Labrador and pit bull mix who Jonathan affectionately refers to as literally his “Road Dog”; she accompanies him on constant commutes to both Monday Night locations every day. 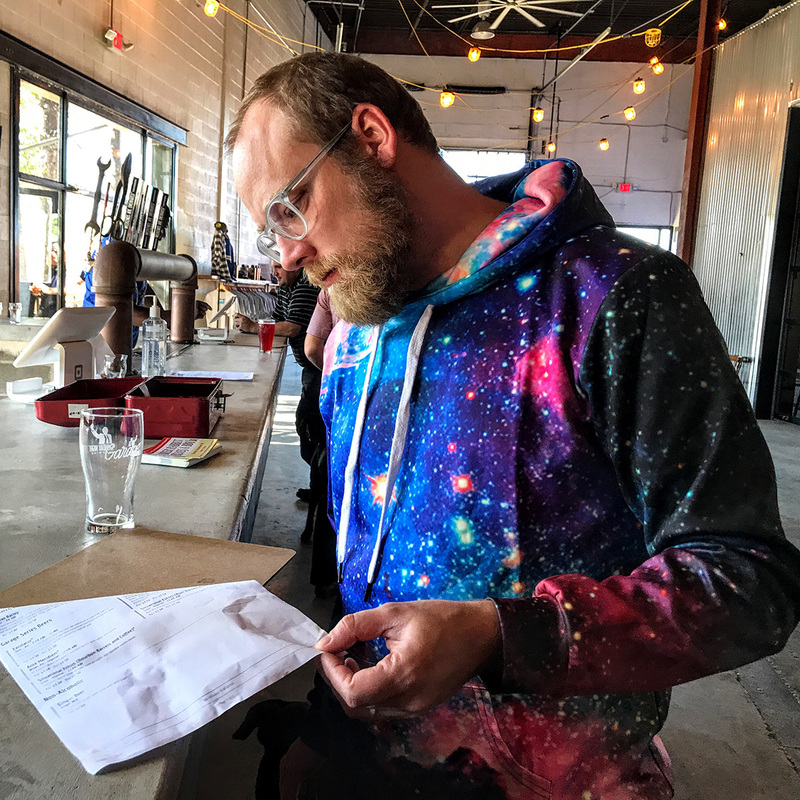 Clad in faded jeans, vintage Nikes, and a hoodie boasting a vibrant galactic pattern, Jonathan, 34, adjusts his glasses and studies the list of brews available before making his selection. Laughing, he admits that the last two weeks have been so chaotic that he doesn’t even know what’s currently on tap. Settling on the very popular Han Brolo—an American pale ale at 4.7% ABV—because it’s “super crushable” he says, Jonathan thanks the pourer, and then heads to the next tap station called the “Sticker Taproom Bar” due to all the beer-themed adhesives decorating its base. Eden follows of course. After making a quick glance at the popular Netflix series “Stranger Things” projected on a white wall adorned with sculpted busts of horned animals, flying predators and dinosaurs to simply “trip people out” he laughs, Jonathan is ready to field questions on Monday Night’s amazing story leading to the Garage. Q: Let’s go back to the beginning of Monday Night Brewing. How did it get started and who did you conceptualize it with? Jonathan: I was in a Bible study with Jeff [Heck] and Joel [Iverson] along with some other guys. It started at Joel’s house first and then Jeff’s for five years; the studies began at 6 a.m. on Fridays for an hour and half each session. Jeff and Joel had both been gifted with homebrewing kits, and the Bible study decided to fire one up on a Monday night at Joel’s house back in 2006. We loved brewing and the community of beer so much that we made our Monday night brew sessions a weekly thing. About three months in, I proposed turning it into a business and it blossomed from there. We put in as much of our own money as we had. When that ran out—and it ran out quickly—we turned to friends and family, and also applied for an SBA [Small Business] loan. Q: What were the most difficult obstacles for opening the brewery and why did you pick Atlanta’s Westside? Jonathan: Understanding the legalities of making and selling beer was one of the biggest obstacles we faced opening a brewery. We knew nothing about the three-tier system, the politics of getting your beer on draft, and how many layers of red tape there are. We spent 18 months simply interviewing and choosing a wholesaler partner for our home market. We opened up our original location on the Westside, a part of town where all three of us had recently moved. This area of town has become a great cultural boon to the city with amazing art, music, and food options. 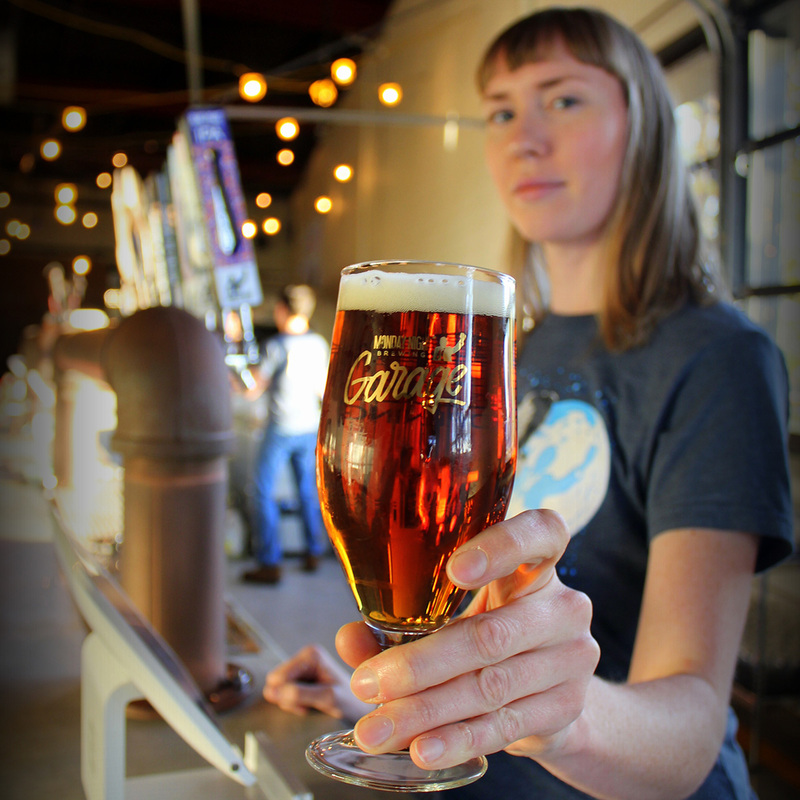 Our brewery is right in the thick of it with ample parking and an amazing patio as well. Q: Name the first beers you came out with at the original brewery and why those? Jonathan: We launched with Eye Patch Ale and Drafty Kilt. Eye Patch was a labor of love for us; it’s an English-style IPA that we brewed 24 different ways over the course of five years tweaking and perfecting. 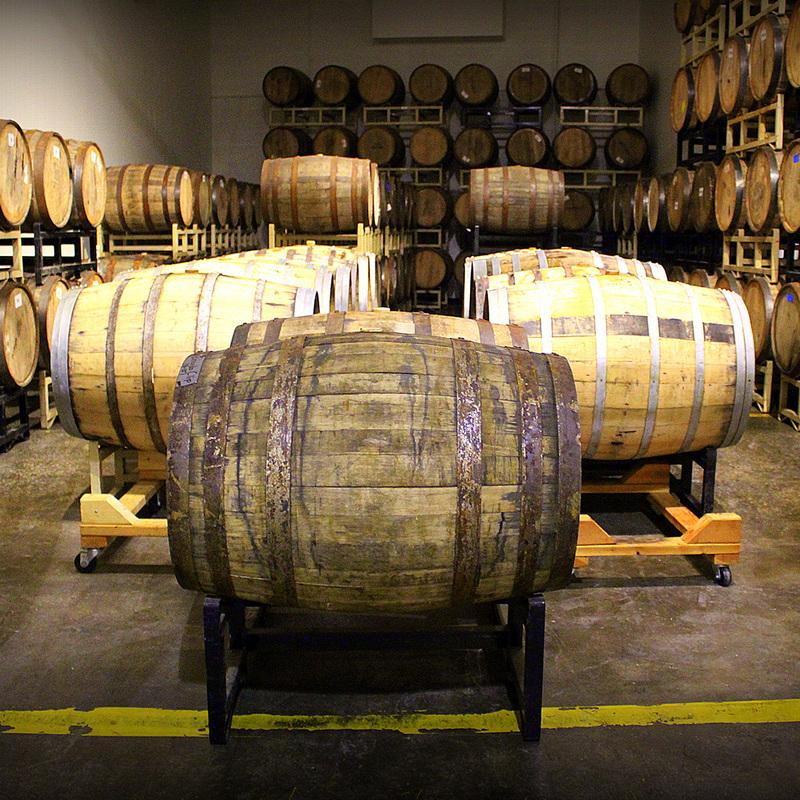 Q: Discuss how the barrel aging began at the original brewery and how that led to the talks about opening the Garage. Q: Talk more about the Garage’s concept? Also, why did you pick the West End and how did you get the support from the surrounding community? Jonathan: It took us about a year from touring the Garage the first time to opening its doors; it was pretty quick, honestly. The name, just like Monday Night, is a reflection of who we are. Peter came up with the ‘Garage’ name over a brainstorming session and some brews one night and it made perfect sense since we homebrewed out of the garage for years. As for the location, we opened the Garage in the West End to build on these two ideas: community and experimentation. 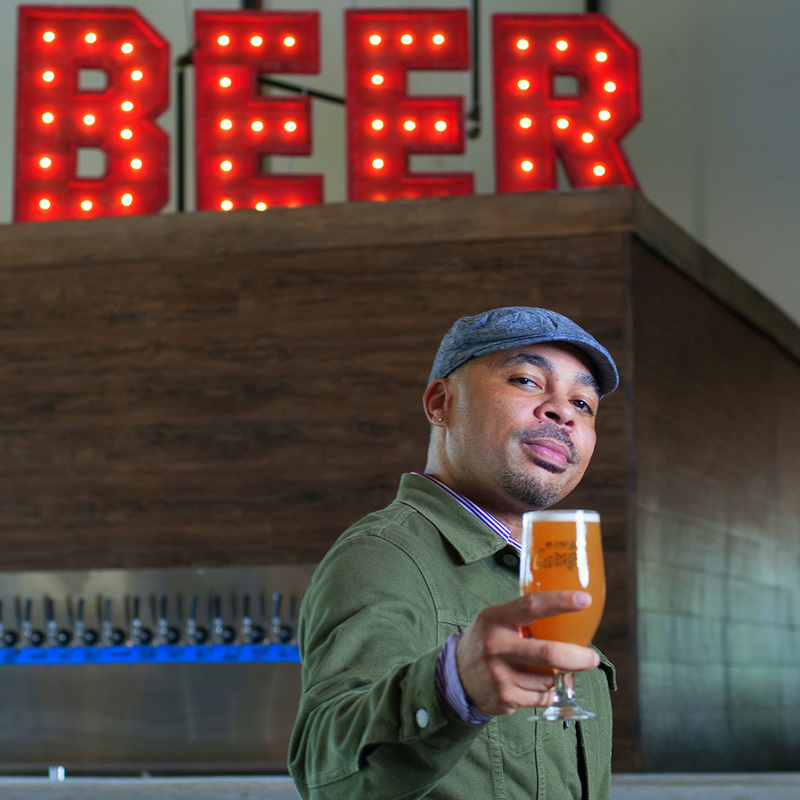 Southwest Atlanta is home to so many vibrant and growing neighborhoods, but it has been a craft beer desert for a while. We wanted to help change that and give these neighborhoods a physical space for them to hang out in. This is an underserved part of the city and part of our mission is to also deepen human relationships. We wanted to have a building and a beverage that pulls people together. That is meaningful to us. Q: Talk about what you plan to brew here, the Crunkship, and your future plans. Jonathan: The Garage is home to Georgia’s first koelschip affectionally named the Crunkship. It is vented to the outside where we have planted an urban orchard replete with fruits like apples, pears, persimmons, grapes, pineapple guava, cherries, blueberries, strawberries, and others. We’ll be able to pipe in all the air congregating around these plants to ferment. We’ll also be able to use these fruits in the production of our beers. We have three barrel-aging rooms with different climate controls so that we can operate their humidity and temperature levels independently. We have a primary fermentation room, a souring room and a clean barrel room. In the main production area, we’ve installed some new stainless-steel tanks in addition to two foeders with more to come. We also moved our bottling line down from our original brewery and are in the process of installing a lab. We have some pretty crazy stuff planned for the future, but what we’re doing here at the Garage is what we call “slow beer.” We want to combine traditional methods of brewing and aging with new ideas and processes. Some of these beers will take years to complete, so I think you’ll really see us hit our stride around 2020. That’s not to say we won’t be putting out good beers until then; we already have some pretty fun stuff in barrels over there, with more on the way.